The Ultimate Typing Tutor Keyboard The Ultimate Typing Tutor Keyboard – MillionClues! Ever tried learning typing using a Typing Tutor Software? When I was getting my typing lessons, I was told that I shouldn’t look at my keyboard, even if I am doing it all worng. Well, that doesn’t work easily, unless you have military level of discipline, you are gonna look over and over to find the o’s and the w’s. What do you think? Such a keyboard would defenitely help anyone learn typing; Necessity will become the mother of invention… right? Typing is a skill. Consistent practice will determine how much your typing speed will increase. Close your eyes and type buddy ! 😀 .. It helps .. I guess…. My keyboard is in this state now. In spite of that, I’m still not a good typist and have to cheat and look sometimes and I’m no where near 60 words per minute. I haven’t removed my keyboard cover till now. It had been 2 years since i bought it still looks as new. Typing Master is a very good software. I have been using it for long time and also now. It helped me a lot to improve my typing speed. What is your average typing speed Arun ? 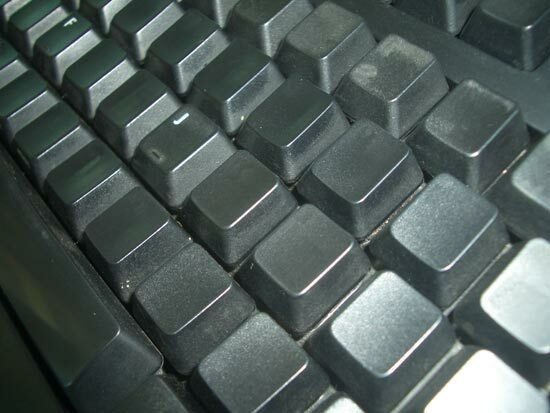 ..
Wow…This is the keyboard that i was searching three year before for improving my typing skills. After my SSC. first thing i did is learn typing and it helps me a lot. It was my Dad’s brother who advised me to learn typing. I always do whatever he tells me. If I hadn’t learnt typing, I wouldn’t be blogging, maybe..
Haha thats awesome. Once I finish my typing lessons i’ll have to try that. WOW! awesome dude! shld hav tried it before! he hi! SO is this the secret of ur typing speed? I like to share one tip to improve typing speed for symbols. Try to type the emoticon and smiley symbols in IMs like Yahoo ! Messenger rather than selecting them from the panel. Best way to cheat is to use a Dictation type of software! Le the computer do the hard, boring stuff – isn’t that what it is supposed to be for?